Falkirk-based Horizon Reinforcing & Crane Hire Ltd is a family business that has been operating for over 45 years and is into its third generation. 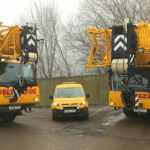 Its fleet of cranes now runs to 18 in number and four of those are Liebherr cranes: two LTM 1060-3.1 mobile cranes, the newest of which was purchased in November as a machine replacement, an MK 88 Plus mobile construction crane and its most recent purchase, the LTM 1200-5.1 mobile crane. The LTM 1200-5.1 has recently been delivered to replace Horizon’s LTM 1250-5.1 and has the advantage of a longer boom, which suits the company’s needs. Measuring in at up to 72 m, the very long telescopic boom is an outstanding feature of the five-axle LTM 1200-5.1 and the boom can be further extended using various lattice extensions and a folding jib. Its entire operating range features outstanding load capacities with the maximum load capacity at 200 tonnes.